Welcome back to another episode of The Art of Business English. This is episode 70 and today we are going to be looking at adjectives and adverbs for describing trends. If you need to present facts and figures, report on change in your organisation, if you work in sales, accounting, in fact in most parts of the organisation, then you will find today’s episode extremely useful. Let’s get started with the basics, the simplest way to describe an adjective is a word that describes or clarifies a noun. Adjectives describe nouns by giving some information about an object's size, shape, age, colour, origin or material. Some common adjectives are “big”, “small”, “round”, “red” and wooden. ​There are a few rules we need to follow when we are dealing with adjectives in English. Unlike with Spanish, adjectives follow different rules. ​The first rule that is often forgotten is that adjectives do not have a plural form. Many of my students make this common mistake. They will say “difficults” problems. This is of course incorrect as we never change the form of an adjective in English. ​The second rule that must be followed is that adjectives always come first. So, to demonstrate, we would say a “red car” not a “car red”, as with Spanish. I often see this mistake made when students use the word “enough”. This is because the structure for enough changes when you use either a noun or an adjective. The adjective must always come first. So, we say strong enough, not enough strong. However, when we use a noun then the noun comes second. For example, enough people. ​The final rule that non-native speakers need to be aware of, is that when using multiple adjectives, they follow a set pattern or order. Obviously native people never think about this, it just comes naturally to us. However, if you use the incorrect order of adjectives then it can sound strange to a native speaker. A large round wooden table. ​So, now that we have adjectives covered, let’s take a quick look at adverbs. Put simply, an adverb is a word used to modify a verb, an adjective or another adverb. Many adverbs in English finish in “ly” and it is pretty straight forward changing an adjective to an adverb. For example, quick is an adjective, if we add “ly” then we transform it into an adverb, quickly. Now that we have a clear understanding of adjectives and adverbs, let’s move onto the next part of this episode. The following skills are especially useful for presenting in English. 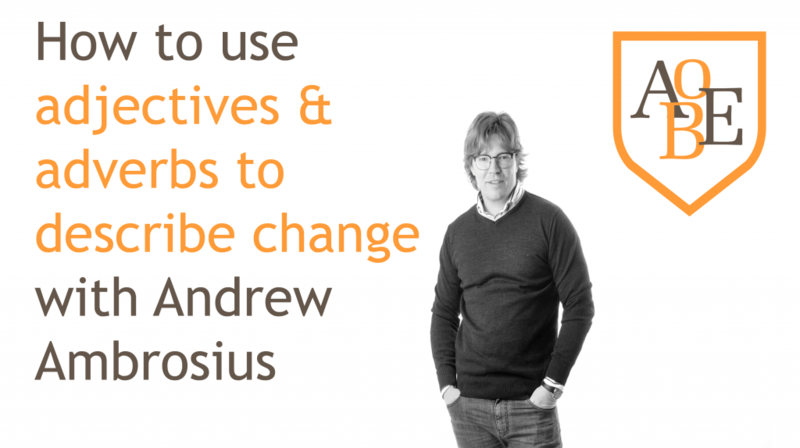 We are often required to describe change within our organisation or our work area. Below I am going to give you a list of adjectives that are used to describe the degree of change, then the translation. Now, I am going to provide you with a list of the corresponding adverbs that can also be used to describe change. As you can see, we have added “ly” to all of the previously mentioned adjectives to create adverbs, with the exception of “small”. With regards to the Spanish, we are adding “mente” which, in this case would the equivalent to adding “ly”. Let’s move on to the next part of the episode where I will outline some adjectives and adverbs for describing speed of change. Let’s take a look at the adverbs that correspond to these adjectives as well as the translations. So, there you have it my friends, another list to help you talk about the speed of change. Now, in the last part of this episode we are going to bring it all together with a look at how we can use them correctly in speech. As with most things, we need to follow some rules in order to use adjectives and adverbs correctly. When we construct sentences using an adjective or an advert to talk about degrees of change or the speed of change then we must take care to use the correct word order. Let’s start by taking a look at adjectives. As we learnt in the first part of this episode, adjectives qualify nouns and they must be placed before the noun. So, let’s take a look at some example sentences so you know what I mean. As you can see in the following graph, there has been a steep rise in the number of insurance claims in the second quarter. The following chart shows a sharp drop in the number of new sign ups over the last month. In these examples we can see that the adjective is found in the middle of a sentence and it is working to modify the noun. Let’s compare these sentences to adverbs. As you can see in the following graph, the number of insurance claims in the second quarter has risen steeply. The following chart shows that the number of new sign ups in the last month has dropped sharply. So, you should now notice that the adverb in these examples finishes the sentences and we change the order in which we present the information. This is because we can’t put an adverb with the noun and say a “steeply rise”. Adverbs qualify verbs and not nouns, so we must say “to rise steeply”. Before I finish, I will give you some more example sentences to help you better apply the knowledge. This chart shows a slight increase in sales for the quarter. This chart shows sales in the last quarter have increased slightly. There has been a considerable impact on tourist numbers after the earthquake. Tourist numbers have been impacted on considerably, since the earthquake. We have seen a rapid growth in new account signups. We have seen new account signups grow rapidly. We have had to make swift changes to our customer satisfaction process. We have had to swiftly change our customer satisfaction process. ​OK, there you have it my friends, a nice overview of how we can use adjectives and adverbs to talk about the degree and speed of change in business situations. Well, that is all from me for today, I hope you have found the content useful. Remember, please feel free to send me an email with your questions. As always, if you want to improve your business English and work with me and my team then we invite you to join the AOBE master’s programme where you will get free weekly coaching. Just head over to the AOBE website and check out the membership options. In the meantime, have a great week and I hope you enjoy applying this lesson to your next presentation or report.